WASHINGTON — U.S. builders broke ground on fewer apartment buildings last month, pushing overall home construction down 3.7 percent from March. The Commerce Department said Wednesday that housing starts fell to a seasonally adjusted annual rate of 1.29 million in April, lowest since December. Apartment construction tumbled 12.6 percent to 374,000. 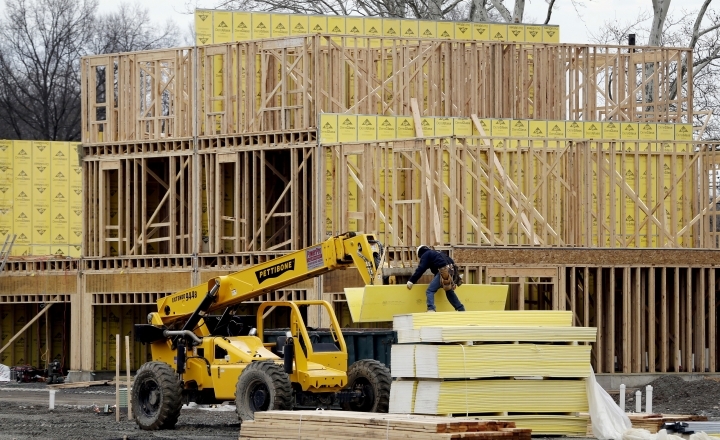 Construction of single-family homes blipped up 0.1 percent to 894,000. Still, housing starts are up 10.5 percent from April 2017 on a 7.2 percent increase in single-family homes, and a 19.1 percent surge in apartments. Home construction has grown steadily since the housing crash hit bottom in 2012. The pace of homebuilding is still below its long-run average of about 1.5 million a year, which has led to a shortage of homes on the market. Millennials are increasingly moving out on their own to buy their own homes. Demand for housing is strong despite an uptick in mortgage rates: The rate on the benchmark 30-year, fixed-rate home loan is 4.55 percent, up from 4.05 percent a year ago. In April, housing starts fell 16.3 percent in the Midwest, 12 percent in the West and 8.1 percent in the Northeast. They rose 6.4 percent in the South. Building permits, an indicator of future construction, fell 1.8 percent in April to a seasonally adjusted 1.35 million.